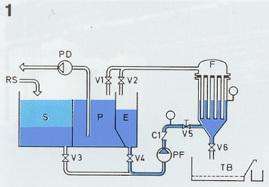 After the complete filling of tanks P (clean liquid) and E (coating) and tank S (dirty) at least to one-third, the filter pump PF is started up. Flow adjustment by Valve 5. 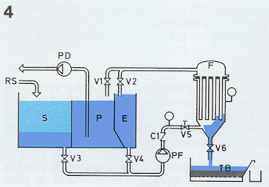 Following the filling of the Filter (F) the level in the Coating tank (E) descends to the minimum, thus creating an area of turbulence favouring the mixing of the Ecofilter® additive which is now poured into vat E.
With the Ecofilter® being deposited on the cartridges, we can pass on to the filtration phase by opening V3. V4 is progressively opened; V2 is closed after the filling of vat E with simultaneous opening of V1. The dirty liquid return (RS) is enabled and the distribution pump PD can be started. The filter pressure gauge (max. 2 bar) indicates the need for unclogging. 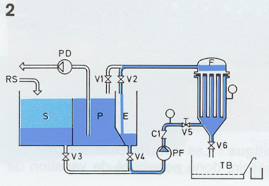 Shutdown of the distribution pump (PD). Sudden opening of valve V6. The cake is dislodged from the cartridges and falls into the sludge treatment vat (TB). Closure of V6 after 5 minutes and return, after checking the levels, to phase 2. According to the types of installation, the cycles are controlled manually or semi-automatically. 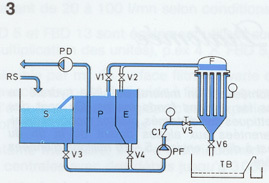 Large installations are, in principle, fully automatic, phases 1 – 4 including sludge treatment. These installations do not need any monitoring.